Having a professional full-body massage can leave you feeling light as a feather, especially when it's part of a monthly routine. "If you're getting regular treatments, you'll be much more relaxed, and you'll sleep better," says Denise Borrelli, Ph.D., a massage therapist and psychotherapist in Medford, Mass. "For insomnia, basic Swedish massage is very effective." Until you can find the massage therapist of your dreams, Borrelli offers four simple self-massage techniques to try at bedtime. Foot Massage: While sitting or lying down, place both thumbs on top of one foot near the toes, and the fingers of both hands on the bottom of the foot. Squeeze the foot for 2 seconds and release for 1 seconds. Work your way from the toes to as close to the ankle as you can manage, then switch feet and repeat. Better yet, recruit a friend. "Any type of foot massage is extremely relaxing for the whole system," Borrelli says. Shampoo Stroke: Lying in bed, gently massage your head as if shampooing your hair. Continue until you begin to feel relaxed. Scalp Roll: With fingers touching at the top of your head, roll the scalp skin forward and back over your skull in a light, rhythmic motion. Continue for as long as the movement feels soothing. Thumb Knead: Cradle the back of your head with your hands so that your thumbs come together at the occipital ridge (the protrusion where the skull meets the neck). Using your thumbs, gently press upward on the skull in a circular motion, gradually working your way over to your ears. Lie on the floor and prop your calves on the seat of a chair, with your knees directly over your pelvic bones and your bent legs forming a go-degree angle with the floor. (If you find the floor too uncomfortable, you can lie flat in bed.) Open your chest, place your arms out to the sides, and turn your palms upward. Observe your breath as you Inhale. Pause and observe your exhalation. With each breath, Increase your exhalation by 1 second and repeat until you've reached a comfortable maximum. Stay at that length for 12 breaths or longer. Return to your natural breathing cycle. "If you're not in bed already, this would be a great time to get up and go to bed,"
Applying gentle acupressure to targeted points on the body can release stress and promote deep relaxation, says Michael Reed Gach, Ph.D., director of the Acupressure Institute in Berkeley, Calif. According to a Taiwanese study published in the American Journal of Chinese Medicine, subjects who received 15 minutes of either acupressure or transcutaneous electrical stimulation three times a week for a month experienced better sleep and better moods than those in a control group. "Two very important and effective points are between the ankle bone and the heel, K6 and 862," Gach says. "Place your thumb on one side of the ankle bone and your fingers on the other side. Squeeze between the ankle bone and the heel. Hold for two to three minutes with firm pressure." Repeat with the opposite hand and foot. Then stretch your arms up and back to induce a deep yawn. If you're carrying knots of tension between your shoulder blades, Gach offers this tennis-ball tension tamer that stimulates about 20 acupressure points: Put a couple of balls in a sock and place them on your bed. Lie down so the balls are directly between your shoulder blades, or where the tension is greatest. Hold this position for two or three minutes with your eyes closed, breathing slowly and deeply. Afterward, stretch your arms and legs to induce a deep yawn. Listening to music can trigger the relaxation response, a state of deep rest marked by reductions in blood pressure, muscle tension, and heart rate, says David W. Luce, Ph.D., a board-certified music therapist and director of music therapy at Chapman University in Orange, Calif. Researchers from the University of Nevada at Reno found that listening to music helped women fall asleep faster, experience fewer nighttime awakenings, and feel more satisfied overall with the quality of their sleep. Another study, published last year in the Journal of Advanced Nursing, showed that sleep improved for slumber-challenged participants who listened to 45 minutes of music each night at bedtime. What kind of music works best? 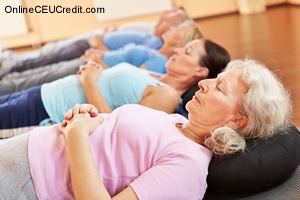 Luce uses a variety of music for sleep induction — Middle Eastern, Native American, even chant. Three of his current favorite CDs for relaxation include Canyon Trilogy by R. Carlos Nakai, Migration by Peter Kater and R. Carlos Nakai, and Canyon by Paul Winter. But the best solutions are tailored to your own tastes. "You can't just say, 'Listen to Mozart,'" says Luce. "Find the piece of music that speaks to you and allows you to take deep, relaxing breaths and leave the stress of the day behind." Ayurveda uses a variety of tools, including herbs, meditation, and diet, to maintain optimal health. In this ancient Indian system, there are three constitutional types, or doshas: vata (restless and creative), pitta (driven and prone to anger), and kapha (calm and loving). To determine your dosha, visit whats yourdosha.com. and take the quiz. While kapha tends to hibernate naturally, vata and pitta can be prone to insomnia. If your condition results from restlessness and a chaotic personal life, you may have an overabundance of vata; if you find yourself lying awake and making mental lists, you may need to tone down the pitta. Both types can benefit from getting to bed by 10 p.m. "Pittas especially must consciously disengage from goal-oriented activity at least 60 or 90 minutes before bedtime," says David Simon, medical director and co-founder of the Chopra Center for Well Being in Carlsbad, Calif. Another beneficial ritual: self-massage followed by a warm bath tailored to your dosha. If you're vata. use almond oil for the massage and vanilla and lavender oils in the bath. Pittas can try olive oil for the massage and sandalwood and rose oil in the bath. Vata might also sip warm milk with nutmeg, honey, or cardamom, while pittas should try mint tea. Some weary people are genetically programmed to be good sleepers, but sabotage themselves with bad habits like getting too much caffeine, says Joyce Walsleben, Ph.D., head of behavioral sleep medicine at the New York University School of Medicine Sleep Disorders Center. Light therapy sets the stage for a restful night. "Get outside in the morning for at least a half-hour of daylight within 15 minutes of waking," advises Walsleben. "That tells the biological clock it's time to be up." At night, keep your environment as dark as you can, she adds. Exercise is valuable, but there is debate over whether a resulting rise in adrenaline might interfere with sleep. As a general rule, finish your workout at least three hours before bedtime, says Walsleben. Changes in your routine disrupt sleep, too. Keep your bedtime and wake time the same from day to day — or at least don't let them vary more than two hours, says neurologist Frisca Yan-Go, M.D., medical director of the Sleep Disorders Center at Santa Monica-UCLA Medical Center in Santa Monica, Calif. And nix the nightcap. Alcohol may make you drowsy, but you'll sleep less soundly. "A glass of wine at 10 p.m. will probably wake you up at 1 a.m.," Yan-Go cautions. Try herbal tea or warm skim milk. Both doctors say to alter how you think about insomnia. When you wake up at night, don't open your eyes (if you do, don't look at the dock) and don't get up unless you have to. Just roll over and go back to sleep. Believe it or not, if you don't make a big deal out of insomnia, it won't be a big deal. If you're already wide awake, Yan-Go suggests an alternative approach: "Get out of bed, sit in a quiet place, and meditate." If that doesn't work, "have a pile of reading material that engages you but doesn't stimulate you. My pile includes issues of Reader's Digest, catalogs, and cookbooks." When intended to coax a good night's sleep, herbal teas are best used in the evening, says Gayle Engels, education director of the American Botanical Council in Austin, Texas. The preceding section contained information about natural therapies for sleep disordered clients. Write three case study examples regarding how you might use the content of this section in your practice. What are seven natural therapies you might recommend to sleep disordered clients? Record the letter of the correct answer the Answer Booklet.